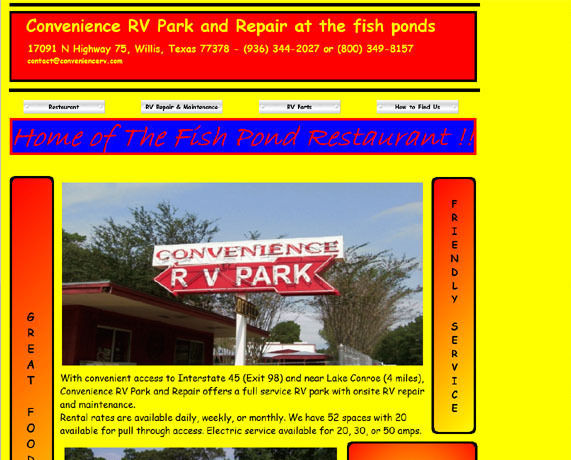 With convenient access to Interstate 45 (Exit 98) and near Lake Conroe (4 miles), Convenience RV Park and Repair offers a full service RV park with onsite RV repair and maintenance. Rental rates are available daily, weekly, or monthly. We have 52 spaces with 20 available for pull through access. Electric service available for 20, 30, or 50 amps. Welcome to the Fish Pond Restaurant!! Restaurant is now open and serving breakfast, lunch, and dinner !! Welcome to Willis Rv Park! We offer the following amenities to make you feel right at home so you can enjoy your stay at The Pines on Lake Conroe RV Park! Welcome to Red Roof Inn Willis! Stay at this Willis hotel located in the lush piney woods of East Texas and enjoy a host of convenient amenities while traveling.